I am officially, officially in love. 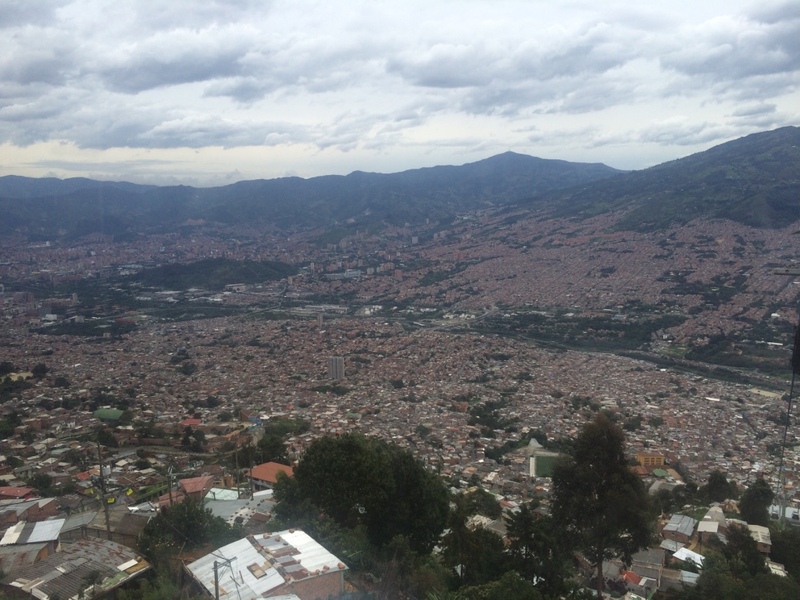 Medellín is, hands down, one of the coolest cities ever in the history of the world. As a testament to how much I love this city, it is one of the cities I've stayed the longest since the beginning of my entire trip (6 days/6 nights). I kept extending my stay because I didn't want to leave. That is true love. Medellín is the second-largest city in Colombia at ~3 million people - and it has VIBES. It's one of those super-hip, super-cool places where you can just feel the electricity and alive-ness in the air (does this make sense??). Medellín lies between a bunch of mountains, so the weather is beautiful and temperate year-round, and there are amazing sweeping views of the city from the hilltops. 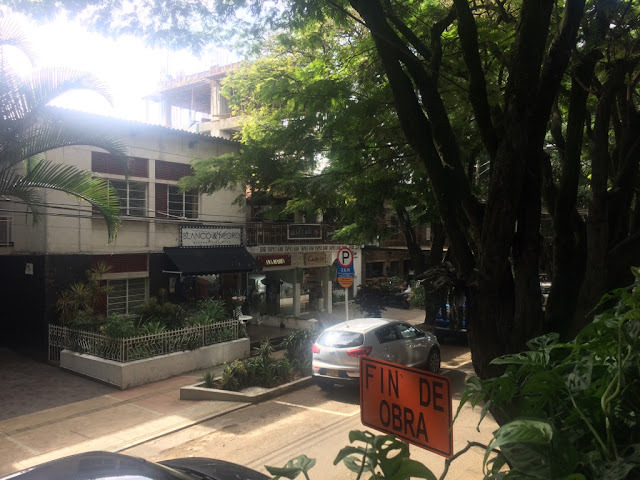 Most gringos and backpackers stay in a swanky neighborhood called El Poblado - this is where I stayed, and absolutely loved. El Poblado is crammed full of trendy restaurants, bars, and clubs: it's the kind of place where you'd find a hip little coffee shop with mismatched dishware and organic soy milk, adorned with ivy climbing up the walls and a large overlook balcony. You know what I mean. 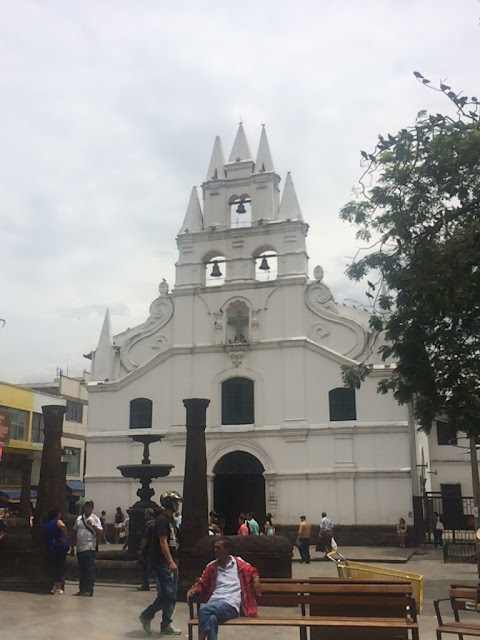 Unfortunately, not that many backpackers find their way out of El Poblado (maybe this is not unfortunate, because I was kind of in love with El Poblado), but if you take the time to wander out of gringo-land, Medellín itself is vibrant and alive and full of surprises. A shot of leafy, pretty, green, trendy El Poblado - and a giant orange street sign, which I failed to notice initially. Also, just as something to note, Medellín is where Pablo Escobar (one of the wealthiest/most dangerous/violent coke dealers of all time) is from, and because of this and its role in the cocaine trade, it used to be one of the murder capitals of the world. It's obviously not anymore, and has recovered in the years since to become the place it is today (one of my favorite cities! 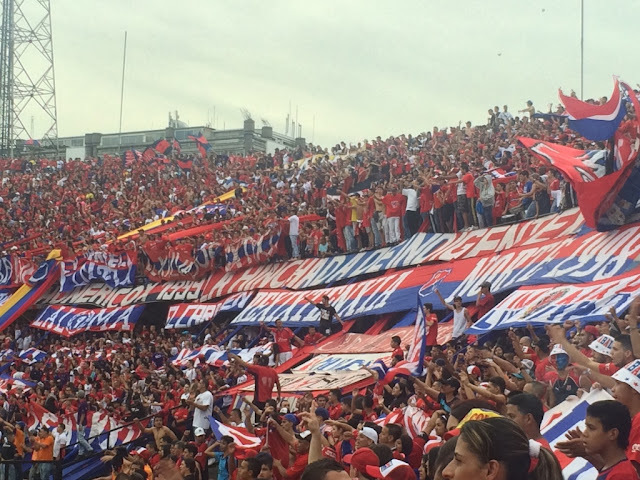 Congrats, Medellín!). 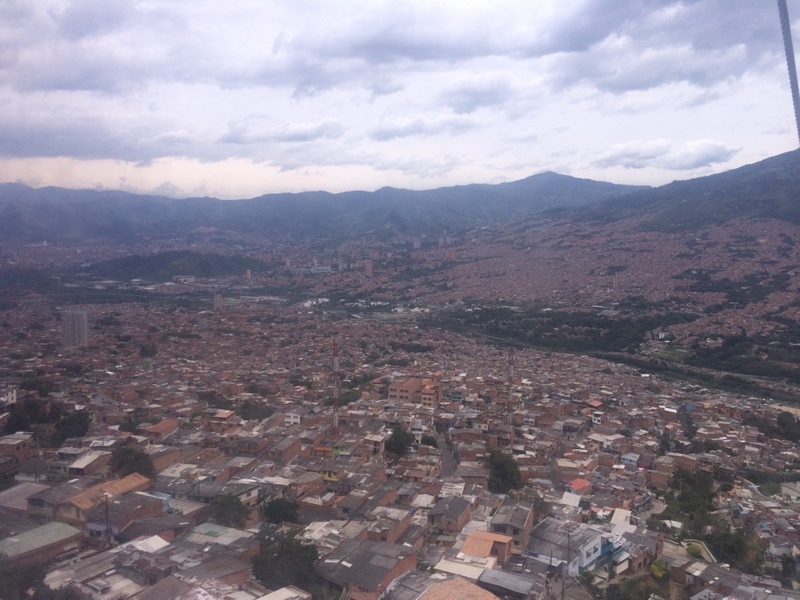 I pulled into Medellín via a total vom-inducing 6-hour minibus ride from Salento - it was the worst because the driver was taking the winding mountain rodes at a million miles an hour, and it was pitch-black outside and the whole vehicle was swerving like crazy. 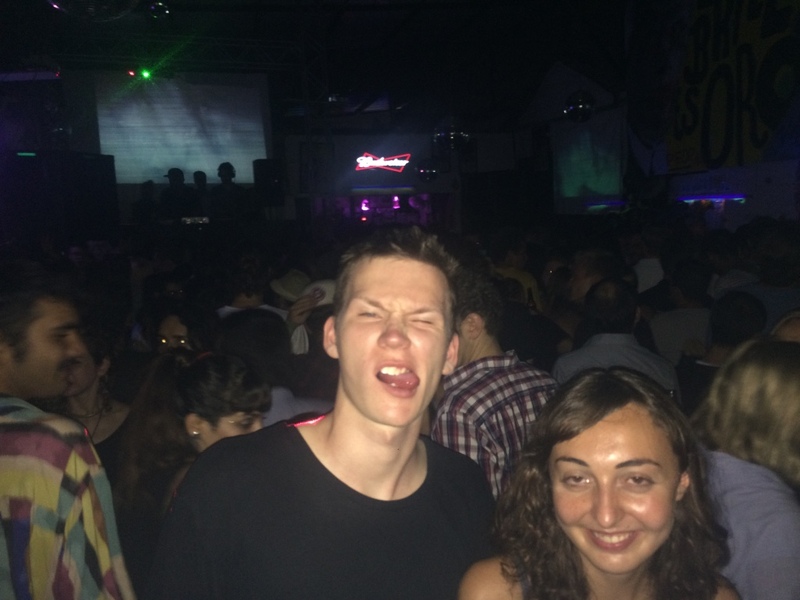 I got in around 11pm to my hostel, and was planning on going to sleep. 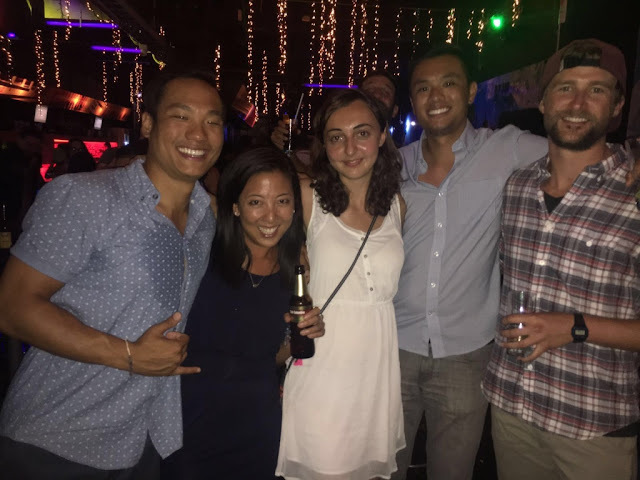 However, the area was totally happening, and I'd passed by all these awesome-looking bars and hundreds of people on the street on the taxi ride to my hostel. On top of that, Richard (from England, I met him on my Galapagos cruise!) 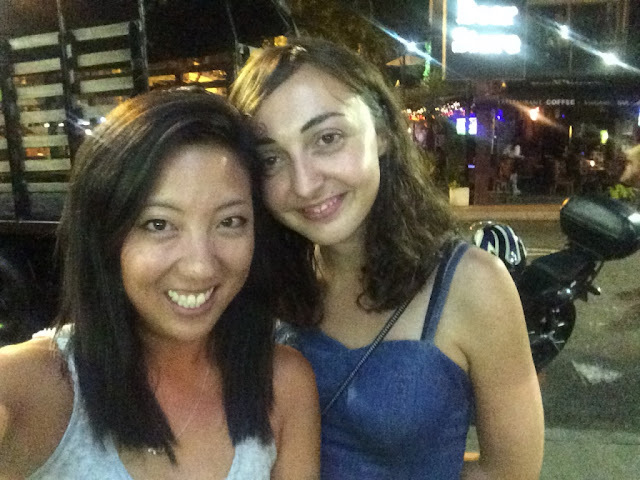 was also in town that night, so I was therefore convinced to go out for a drink. Getting a drink with Richard and all his 20-something super-Euro hostel friends. 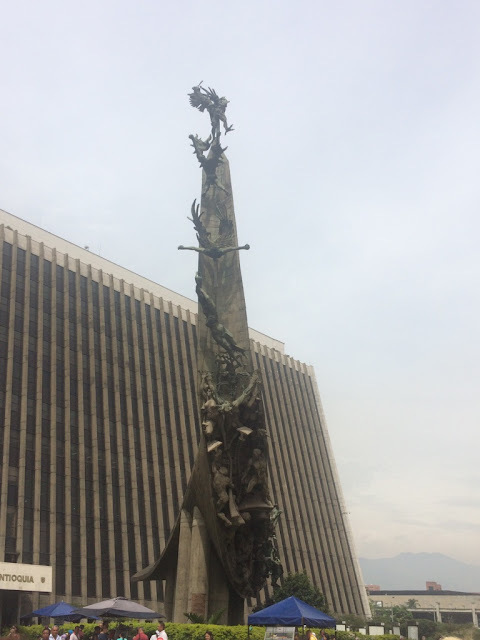 Took a city tour, which was super super super interesting - maybe even beating out La Paz for "most fascinating city tour"! 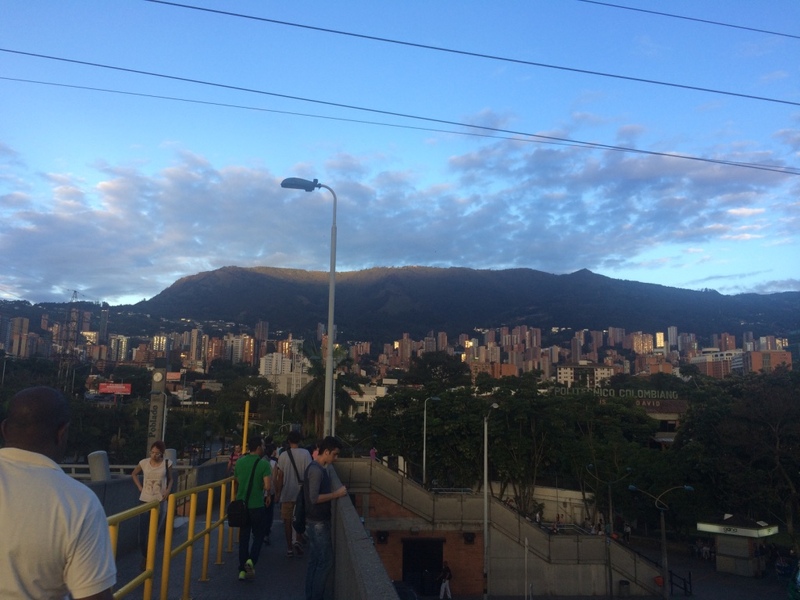 This was an excellent opportunity to leave the El Poblado bubble and get to see some parts of downtown. This is a famous sculpture in the middle of downtown, which depicts the history of Medellín (also notable: the artist had his ashes interned at the bottom of the sculpture in a tiny box. Baller move). People in the region are called paisas, and they are super-proud of their heritage. 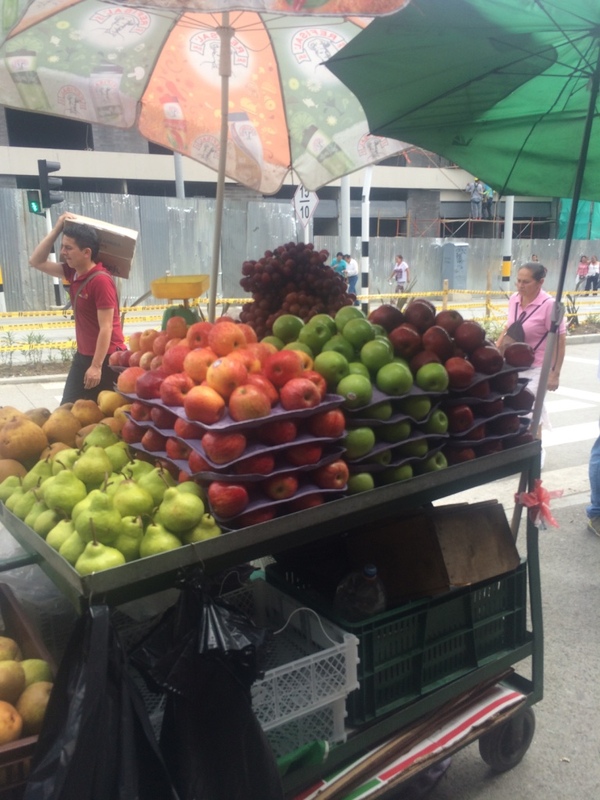 They came originally from Spain and are known to be hard-working and good businessmen - the stereotype is that paisas think they're better than the rest of Colombia. This plaza used to be super super shady, but has now been cleaned up. 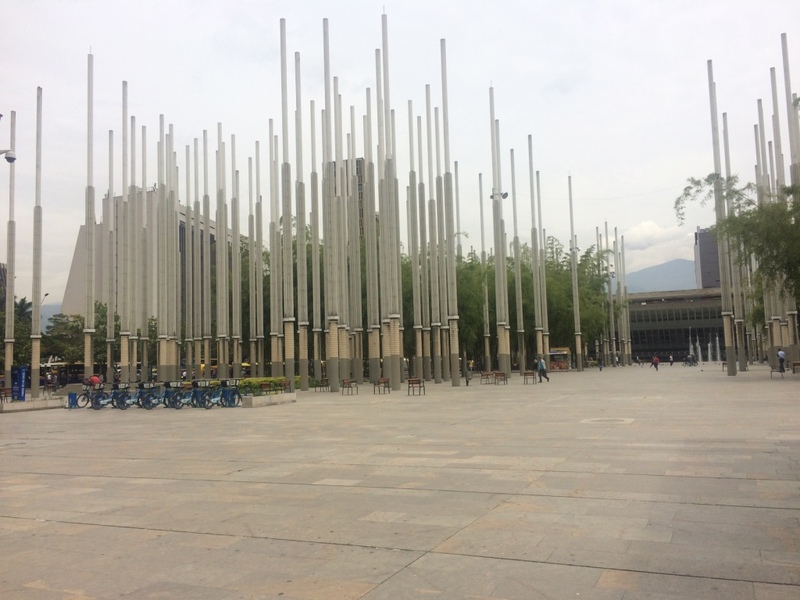 See Exhibit "free bike rentals" and "artistic poles that light up at night." 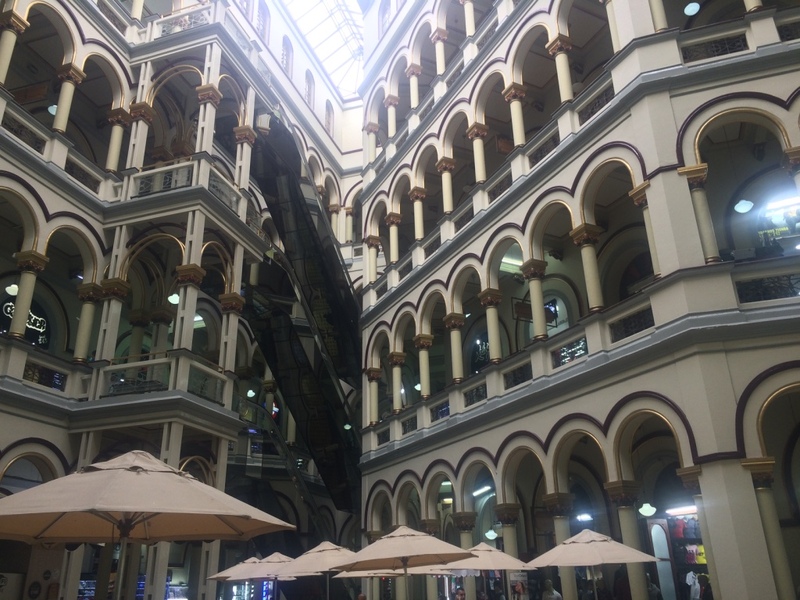 The interior of what used to be some kind of government building, but is now a shopping mall, where you can bargain! (Apparently flattery is the way to get a bargain done here). 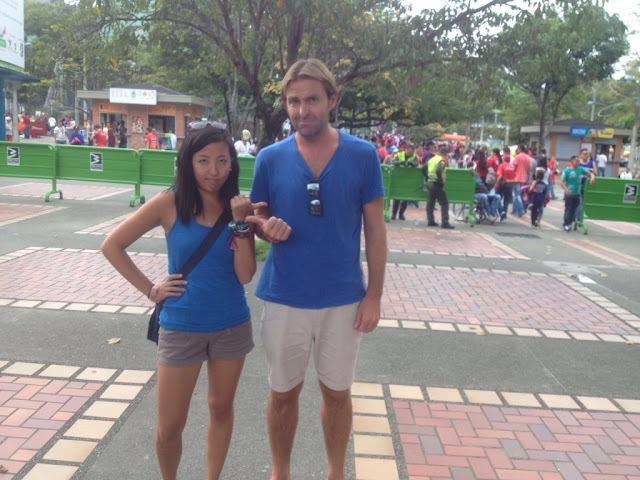 Here is a plaza where someone planted a bomb during a concert, killing a bunch of people. These kinds of things happened a lot back in the era of drugs. 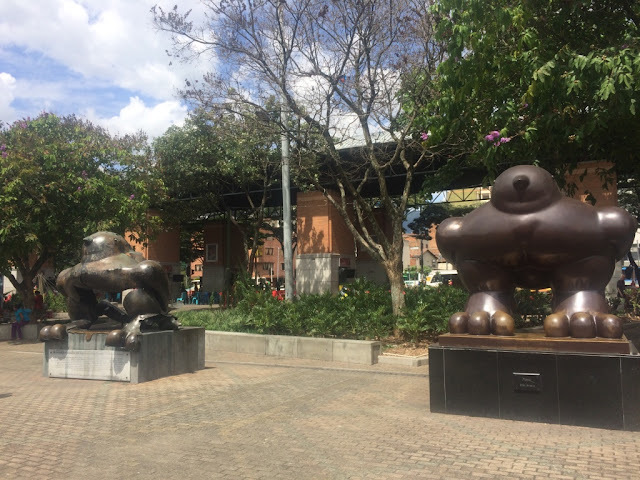 The Botero statue on the left was damaged by the bomb - Botero himself recast the statue on the right, and insisted they put the two bird statues side-by-side, to serve as a reminder of what happened. 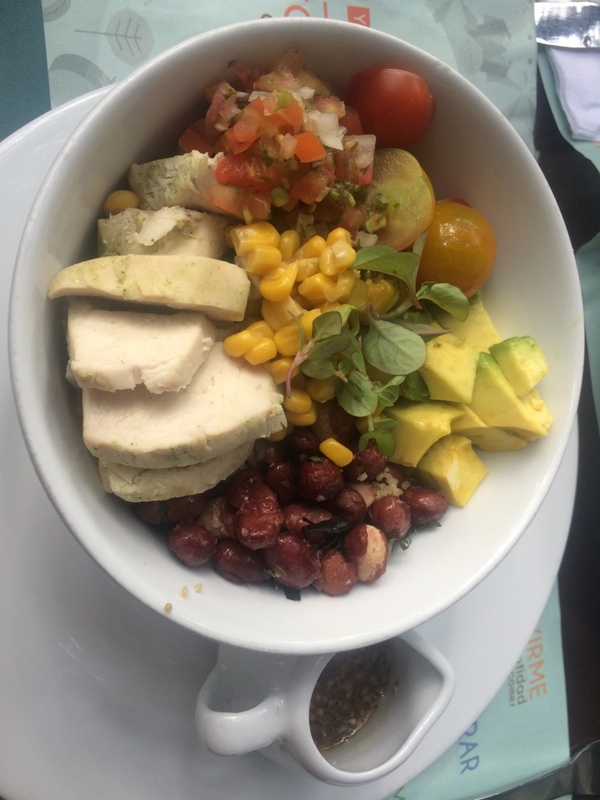 This was some sort of trendy healthy veggie-packed artisanal lunch bowl I got in El Poblado. So fetch. 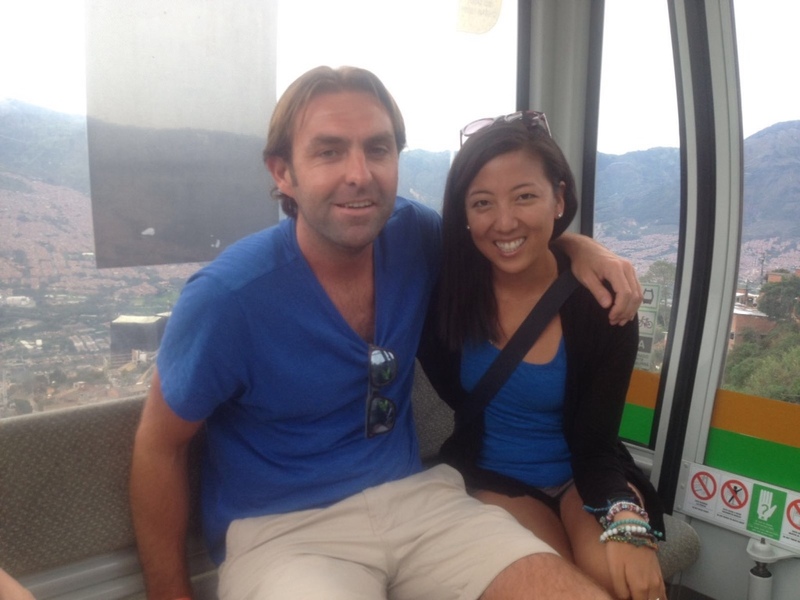 Despite 3 hours of sleep the night before, I met up with Richard to go ride the teleféricos (cable cars) over the city. Teleférico ride over the city! I should stop calling it "a ride." It's just a normal mode of transport for people in these parts. 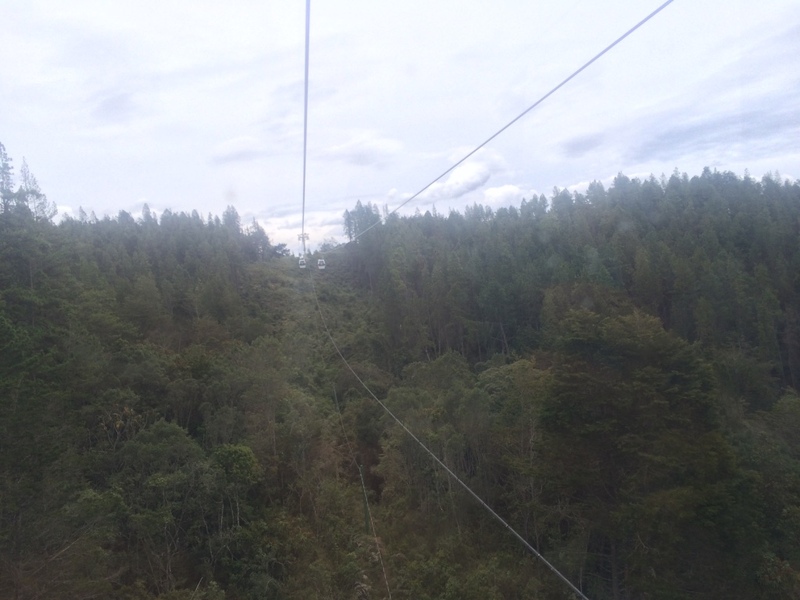 And then, as we transferred from one line to another, it became pure forest. We basically rode the last teleférico into an area called Parque Arvi, which I had assumed was going to be a small, cute park with a playground or something, but was actually a HUGE forest-covered woodland area where you can do nature walks and such. 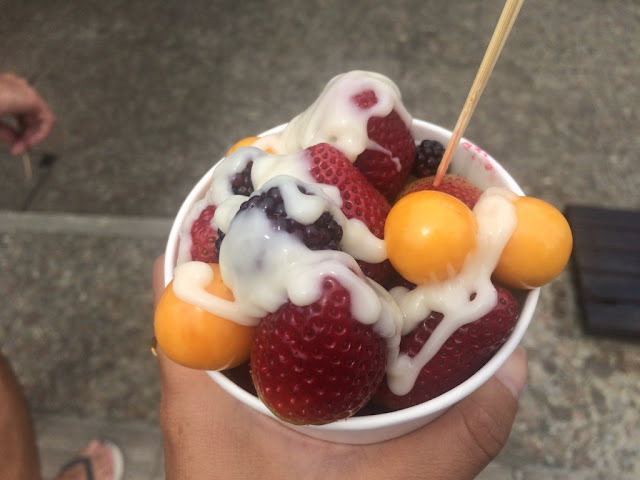 We didn't do a nature walk in Parque Arvi, but we did eat fruit soaked in condensed milk. 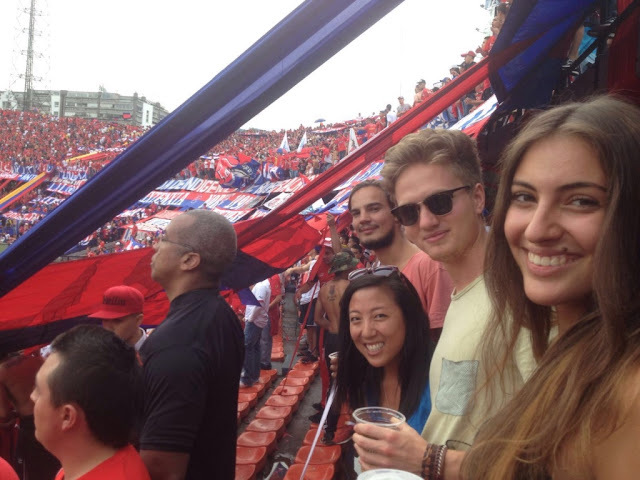 After soaring over the city, we met some others at a local fútbol game. 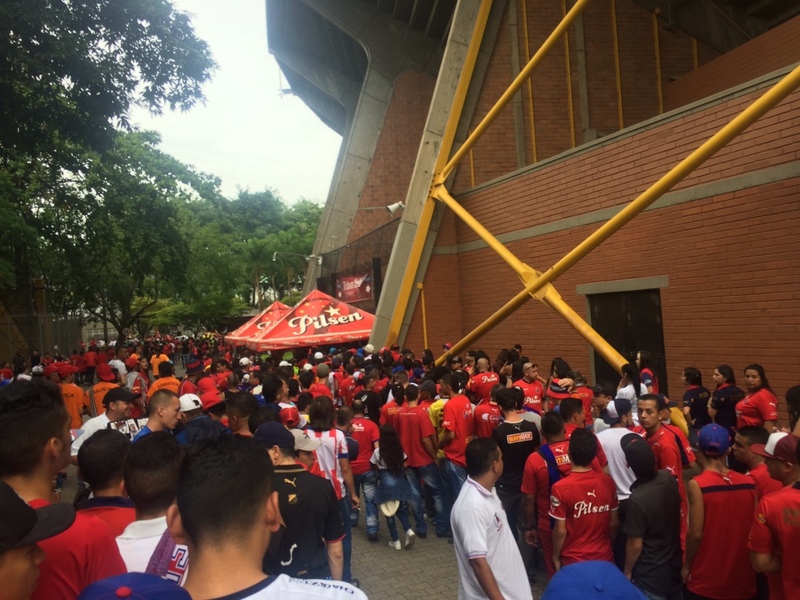 I'd really wanted to go to a game in Medellín because I've heard that Medellín fans are some of the most passionate, spirited fans in all of South America. 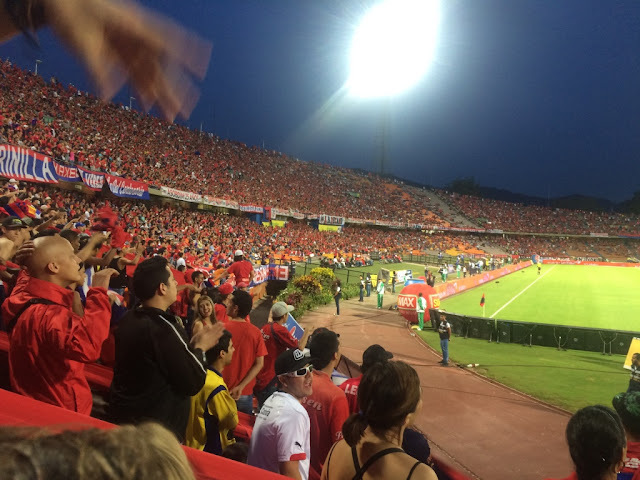 And given that I'd only ever witnessed the sadness and un-spiritedness of the Peru game in Lima, I was excited! 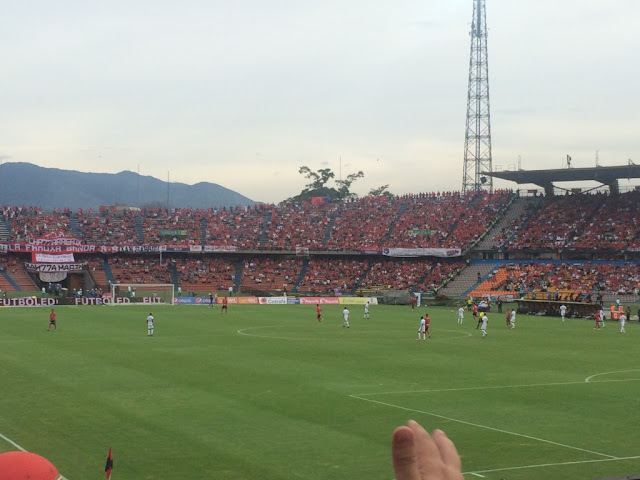 The teams were Independiente Medellín (obviously who we, and the entire city, were supporting) vs. Caldas. Soccer squad! 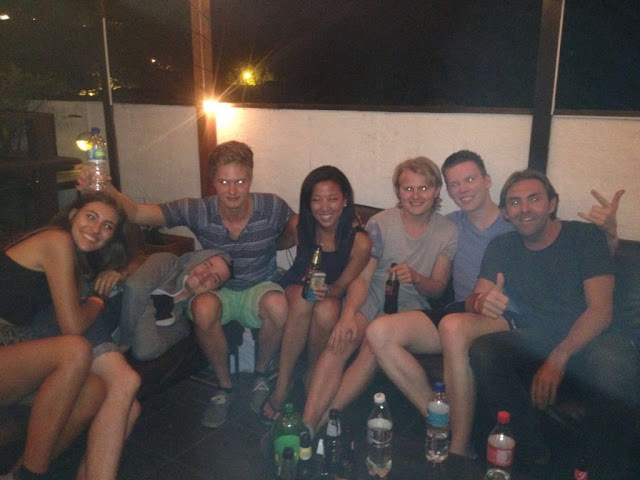 Simba is from Poland, Conrad is from Germany, and I can't remember the girl's name for the life of me because I am officially the worst. The fans never stopped singing. I have a hunch that the game itself doesn't even matter - nobody's watching because they're all busy singing the (what seemed like) endless number of songs in support of their team. There's people with drums and instruments and bongos and the cacophony is just amazing. Again, one of my favorite parts of soccer? That it's 90 minutes. And it was the most action-packed, crazy hubbub-filled 90 minutes ever, which made it all the better. 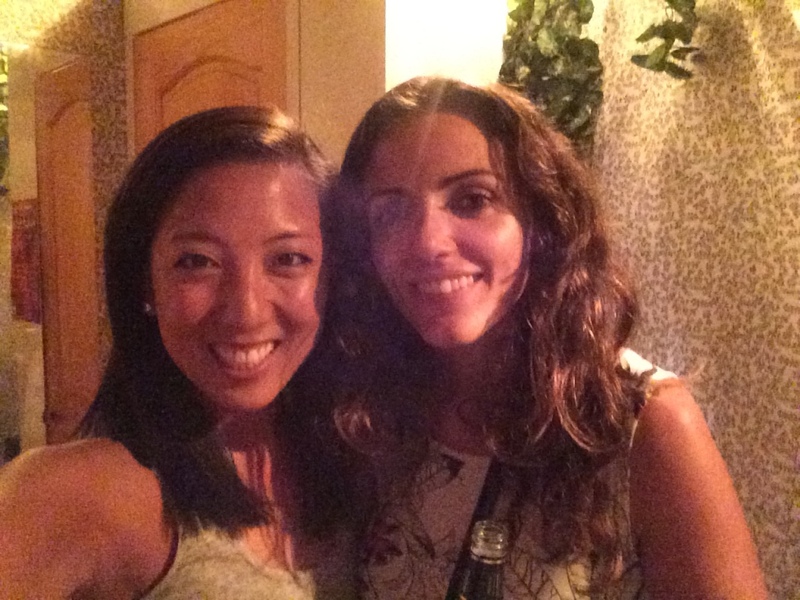 That night, Luci (Italy Luci!) got into town and insisted we go out (and it was a Saturday!). 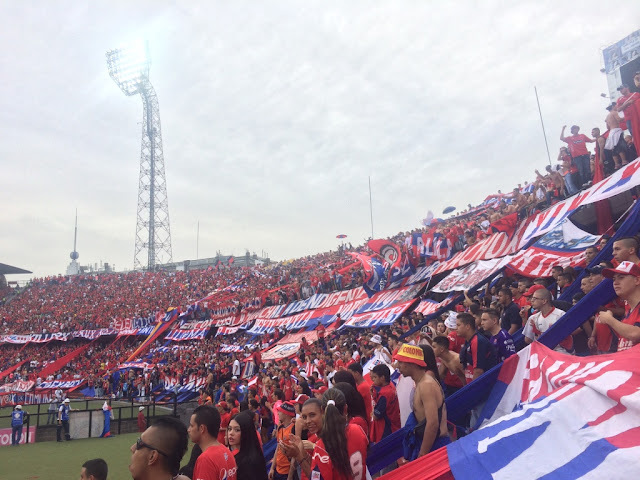 This is a very popular club with the gringos, called Calle 9. We may have gone there two nights in a row. And they only play house music (haaaaaate, why is it so hard to play something people can sing at the top of their lungs to?? ), which means the club is basically crammed full of a zillion European men. 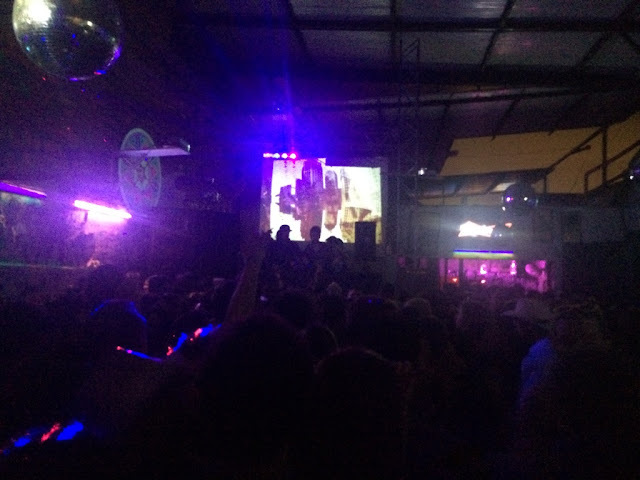 And I was that girl trying to take photos in a club. For you people. Medellín has the only metro system in all of Colombia. They persevered and worked hard to put it in place, and it's something that they are incredibly proud of. Even today, you don't see any graffiti, trash, or marks anywhere in and on the subway (the cars are, in fact, super clean and nice). The people are exceedingly respectful in the cars. Because it is such a source of pride for locals, there is an unspoken rule that they do not disrespect the metro. 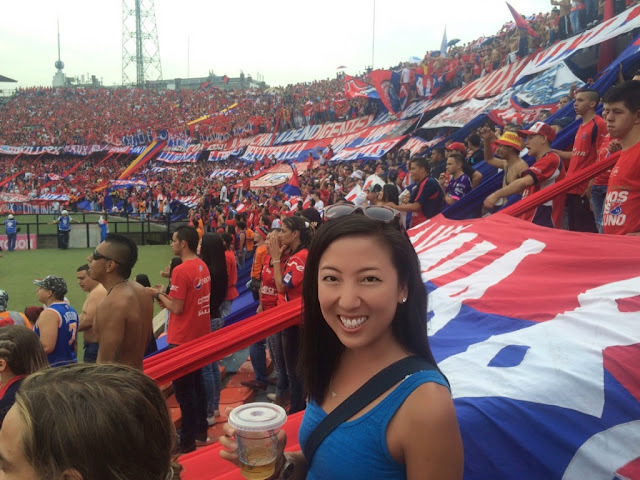 One thing you will find about Colombians - they are joyous, happy, positive people - even despite the dark history of their country. Things were ugly for so long (the drug wars, Escobar, etc.) and people lived in such fear of being killed, as violence, death, and corruption were pretty much a part of everyday life. 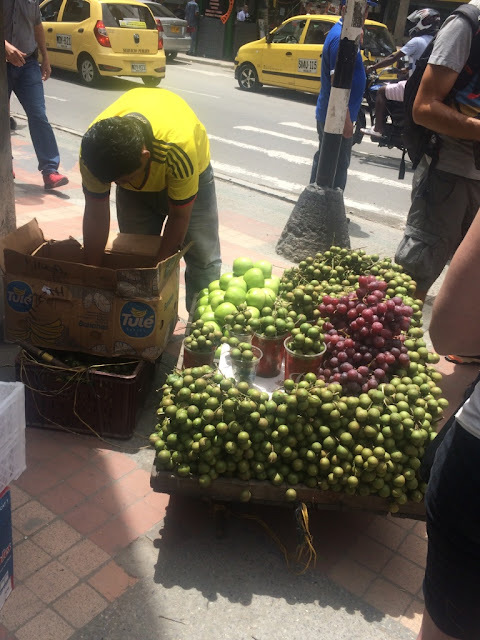 Our guide says that because of (or despite) this, Colombians choose to look forward and take more joy in the little things in life, friends, and family, rather than focusing on the past. In fact, Colombians are some of the happiest people in the world. I find this unbelievable, and a little inspiring. Pablo Escobar was a total monster of a drug lord (he once controlled 80% of the world's cocaine supply and the amount of violence, greed, corruption, and death he brought to Colombia is a stain on the country's past), but some local people still love him because he played Robin Hood and built some facilities for the poor. 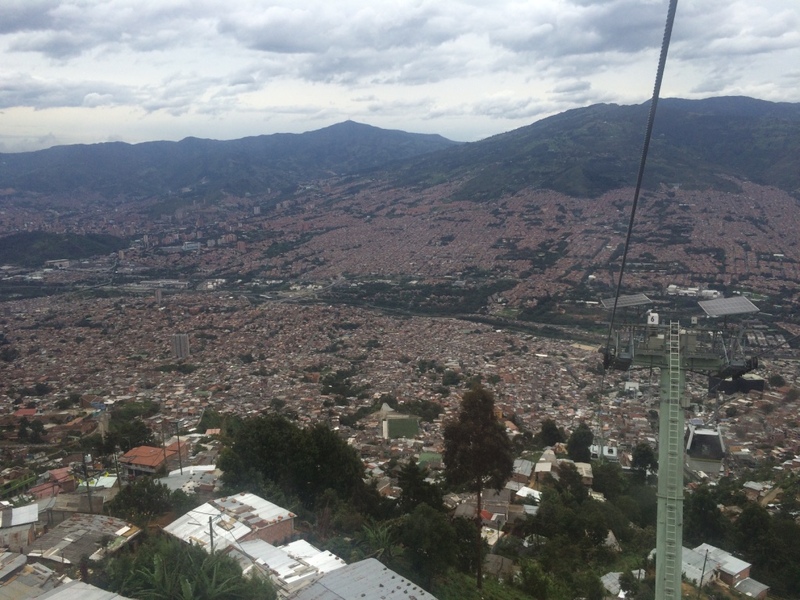 I think everything above is why I love Medellín so much - that it could be this city of fear and violence, and the capital of Pablo Escobar's drug trade - but less than 30 years later, it's re-emerged and reinvented itself into what it was always destined to be, despite the ugliness Escobar subjected it to: an incredibly modern, trendy city filled with happy people.